One call tell the future. With no other family and a life spent in and out of institutions, Aden and the souls have become friends. But now they're causing him all kinds of trouble. Like, he'll blink and suddenly he's a younger Aden, reliving the past. One wrong move, and he'll change the future. Or he'll walk past a total stranger and know how and when she's going to die. He's so over it. All he wants is peace. Somehow, they share an inexplicable bond of friendship. A bond about to be tested by a werewolf shape-shifer who wants Mary Ann for his own, and a vampire princess Aden can't resist. Two romances, both forbidden. 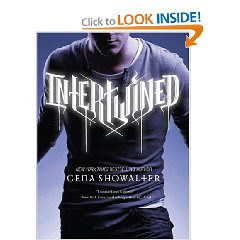 Still, the four will enter a dark underworld of intrigue and danger -- but not everyone will come out alive..."
Intertwined by Gena Showalter is the 2nd offering in Harlequin Teen's new line up. The story is intriguing, very well done and the characters endearing. Poor Aden, he has four souls living inside him who talk to him constantly. He can never get away from their chatter except for when he turns on his ipod full blast and tunes them out. However, when he gets lost in the music he doesn't watch where he is going and that's when the trouble starts. All he has to do is step one foot inside a graveyard and the dead rise to take him on. He is in the midst of battling one of the dead, when Mary Ann walks by the graveyard. Both he and Mary Ann are hit in the chest with a weird wind and neither understand why. Fortunately she didn't see what Aden had been doing and walked on. But Aden followed her, because the souls inside him were suddenly quiet when she appeared. He finds out what high school she attends and arranges (with some difficulty and the help of his souls) to go there. It's supposed to be a small town normal school but for a small school, there is a curious amount of "strangeness" to it. 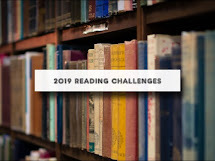 Throw in shape shifters, werewolves, ghosts, vampires, witches and a whole assortment of other characters and the story takes an interesting turn. Very well done and well worth reading. A sequel called "Unraveled" will be coming out in 2010. Thank you to Harlequin for providing me with a copy of the book. "Intertwined ran from the beaten path of common love triangles and replaced it with unexpected romances, mutual untrusting tolerance, sibling-like caring, and ultimately… friendship. It was very refreshing to have characters who knew what they wanted and weren’t afraid to chase after it… even when everything went downhill." "Intertwined is a solid offering for its intended young adult audience - fast-paced, interesting characters, chock full of action and lots of urban fantasy goodness." "I felt this novel was well-executed. Though I went “What?” when more mythical creatures started to appear, my interest didn’t dwindle, the story was gripping. This will inevitably appeal to readers of paranormal romance, and if that’s you, it’s well worth checking out."